From a previous commissioners’ meeting, Gallia Commissioners and the Gallia Sheriff’s Office discuss the increased capacities and needs of the Gallia correctional program. From left to right are Commissioner Brent Saunders, Commissioner David Smith, Gallia Sheriff Matt Champlin and Gallia Sheriff’s Office, Office Administrator Heather Casto. 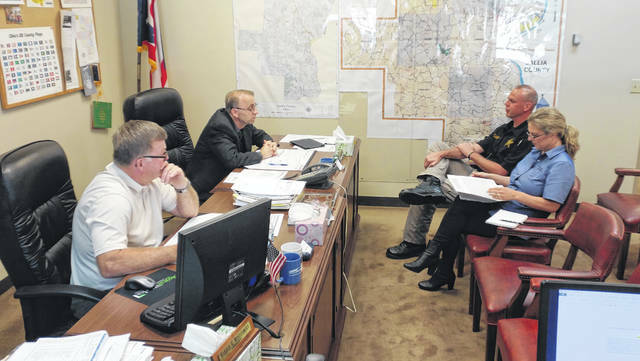 GALLIPOLIS — Gallia County Commissioners appropriated $200,000 Thursday for Gallia correctional uses as arrests climb with the continuing opioid epidemic. Champlin has said transporting inmates can be an issue as the county has contracted with other correctional facilities across the state to house a growing inmate population. The Gallia Jail is a 22-bed facility, but at times may house several more inmates to keep up with drug-related crime arrests with the heroin epidemic. The sheriff’s office has spent $333,000 on out-of-county inmates in food, housing and medical costs from the beginning of the year and into the end of May. Commissioners have said the Gallia general fund has around $8.6 million. With total judicial and law enforcement obligations, around 46 percent of the fund in the past has been dedicated to those needs alone in a single year.